Officials in Milwaukee County, Wis., plan to let bids in the next two weeks for the repair of a municipal parking structure at O’Donnell Park, where a 27,000-lb precast-concrete facade panel fell off the building and killed a 15-year-old boy and injured two other people last June. The county’s 2011 budget has earmarked $6.5 million for structural work on the garage. About $3.5 million to $4 million of the repair cost will go to permanently removing all 70 of the ramp’s precast facade panels, then giving an aesthetically pleasing look to the parapet wall that has been covered up by the panels ever since the structure was built in the 1990s. The cost will include about $1.5 million for other repairs to the 1,175-vehicle structure on Milwaukee’s east side. The county expects work to start in January and be completed in June, before the Summerfest music festival starts nearby. Billed as the world’s largest music festival, the annual event features rock, pop and country music headliners over a two-week period, drawing a total audience of more than 800,000, according to promoters. Jared Kellner was on his way to the festival with friends on June 24, 2010, when a 30-ft-long, 4½-ft-high, 1-ft-thick facade panel fell about 12 ft from its spot above an entrance to the garage. Kellner was crushed and killed. His friend Eric Wosniski suffered a broken leg; Wosniski’s mother required a below-the-knee amputation of one leg. According to Jack Takerian, Milwaukee County’s director of transportation and public works, the county chose to permanently remove the facade panels because 98.5% of the connections were attached incorrectly. 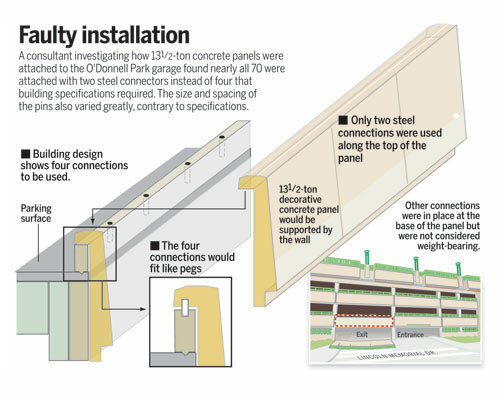 After the accident, the county hired forensic consulting engineer Inspec, Milwaukee, Wis., to inspect the entire parking structure. Inspec hired another consultant, CTL Group, Skokie, Ill., to assist with the inspection and analysis. Investigators examined the structure visually as well as with ground-penetrating radar, ultrasonic tests and videoscopic inspection. The facade panels—upside-down L-shaped cross sections—were designed to be fastened to the top face of the parking structure’s parapet walls. Each panel featured four ¾-in.-dia, 6-in.-long stainless-steel pins inserted and grouted into 2-in.-dia steel sleeves. The sleeves were embedded into the top of the concrete parapet walls as they were placed. C.D. Smith Construction Services, Fond du Lac, Wis., built the parking garage. Advance Cast Stone Co., Random Lake, Wis., designed, manufactured and installed the facade panels. According to the report, only four of 296 connection pins were installed correctly. Many panels were installed with only two connection pins instead of the four specified in the design. In addition, says the report, many of the panels were attached to the top of the parapet wall by pieces of No. 6 rebar in lengths varying from 7½ in. to 17¾ in. The rebar pieces were inserted in holes drilled through the top face of the facade panel and into the top of the parapet wall but not into the pre-set sleeves. Penetration into the parapet wall varied in depth from only ¾ in. to up to 10 in., says the report. “Apparently, the holes on the precast facade panels didn’t match up with the pre-set sleeves in the wall. The contractor could have remedied the problem by drilling through the facade panel and inserting the specified pins into the pre-set sleeves, but it chose not to,” says Takerian. No representative of Advance Cast Stone was immediately available for comment by press time. Furthermore, the detailed follow-up inspection found some cracks and water penetration in the garage as well as structural deficiencies. They will be included as items for repair on the project’s master list.